This fantastic piano key chair struck a chord for sustainable design last weekend at the opening of the International Contemporary Furniture Fair in New York. Created by BRC Designs, the armchair gives tired and out-of-tune pianos a whole new purpose. The surface of the Korobeiniki chair is constructed entirely from the instruments – from the internal wooden frame to the seat itself. The chair’s dynamic, textured exterior features an assortment of layered keys, giving the classic instrument a modern twist. 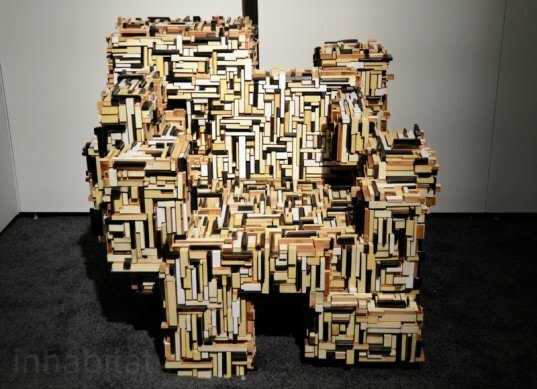 The Korobeiniki chair consists of an assortment of piano keys and parts that have been stacked and joined in a cube-like shape. The different tones of the keys gives a sense of depth to this edgy piece, and its strong structural shape gives it a hint of the dramatic presence of a piano in its original form. South Carolina-based BRC Designs never fails to impress with their unique designs. Having already won us over with their geek-chic circuit table and their card deck chair, we can’t wait to see what unconventional design could be up their sleeve next. Made up entirely of parts of old pianos. Dynamic and textured layers give the design depth. Differing tonal variations of the keys. BRC have created variations on the same concept.